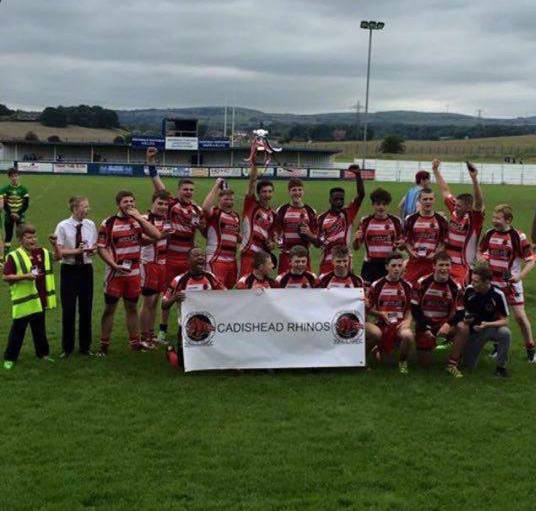 Cadishead Rhinos under 15’s experienced the sweet taste of cup success at the weekend as they lifted the Northwest Development Shield at Rochdale Mayfield. The Rhinos collected the silverware following an 11-10 victory over Wigan St Cuthberts ARLFC in a extremely tight and high quality final. Cadishead got over the line with tries from Full Back Vaughan Murphy and Centre Matt Crawshaw, to edge out their opponents and claim the spoils. Folly Lane Under 13’s suffered cup final heart break in the earlier fixture, but can hold their heads high after a fantastic run to the cup final. Anyone interested in playing community Rugby League can email danny.barton@reddevilsrugby.co.uk for more information on local clubs.